Idiopathic environmental intolerance attributed to electromagnetic fields (IEI-EMF) remains a complex and unclear phenomenon, often characterized by the report of various, non-specific physical symptoms (NSPS) when an EMF source is present or perceived by the individual. The lack of validated criteria for defining and assessing IEI-EMF affects the quality of the relevant research, hindering not only the comparison or integration of study findings, but also the identification and management of patients by health care providers. The objective of this review was to evaluate and summarize the criteria that previous studies employed to identify IEI-EMF participants. An extensive literature search was performed for studies published up to June 2011. We searched EMBASE, Medline, Psychinfo, Scopus and Web of Science. Additionally, citation analyses were performed for key papers, reference sections of relevant papers were searched, conference proceedings were examined and a literature database held by the Mobile Phones Research Unit of King’s College London was reviewed. Sixty-three studies were included. “Hypersensitivity to EMF” was the most frequently used descriptive term. Despite heterogeneity, the criteria predominantly used to identify IEI-EMF individuals were: 1. Self-report of being (hyper)sensitive to EMF. 2. Attribution of NSPS to at least one EMF source. 3. Absence of medical or psychiatric/psychological disorder capable of accounting for these symptoms 4. Symptoms should occur soon (up to 24 hours) after the individual perceives an exposure source or exposed area. (Hyper)sensitivity to EMF was either generalized (attribution to various EMF sources) or source-specific. Experimental studies used a larger number of criteria than those of observational design and performed more frequently a medical examination or interview as prerequisite for inclusion. Considerable heterogeneity exists in the criteria used by the researchers to identify IEI-EMF, due to explicit differences in their conceptual frameworks. Further work is required to produce consensus criteria not only for research purposes but also for use in clinical practice. This could be achieved by the development of an international protocol enabling a clearly defined case definition for IEI-EMF and a validated screening tool, with active involvement of medical practitioners. Although the issue of idiopathic intolerances attributed to environmental exposures (IEI) first appeared in the scientific literature more than five decades ago , the possible underlying causes, as the term “idiopathic” suggests, remain unclear  and there is no widely accepted protocol for the identification of patients and treatment . A representative example is the variety of physical symptoms without a clear pathological basis that are attributed by the patients to relatively low-level exposure to non-ionizing electromagnetic fields (EMF), emitted by sources such as mobile phone devices and base stations, high-voltage overhead powerlines, computer equipment and domestic appliances . This phenomenon is better known within the public and scientific context as "electromagnetic hypersensitivity"(EHS), although since 2005 the term “Idiopathic Environmental Intolerance Attributed to EMF" (IEI-EMF) has been proposed by the World Health Organization (WHO) as an etiologically neutral description . In this paper, the descriptive term “IEI-EMF” is used. According to the WHO , people with IEI-EMF are mainly characterized by the report of non-specific physical symptoms (NSPS), without a consistent pattern , such as redness, tingling, burning sensations in the facial area, fatigue, tiredness, lack of concentration, dizziness, nausea, heart palpitation and digestive disturbances. IEI-EMF is often accompanied by occupational, social and mental impairment [4, 7] and its estimated prevalence varies considerably, probably due to different methodological approaches; 1.5% in Sweden , 3.2% in California , 3.5% in Austria , 5% in Switzerland  and 13.4% in Taiwan . Demographic characteristics such as age, gender and occupational status have repeatedly been associated with IEI-EMF [6, 10]. The experience and belief of IEI-EMF patients is in contrast with the scientific state of the art; results from systematic assessment of experimental and epidemiological evidence are consistent, concluding that a causal association of EMF exposure with symptomatic and other physiologic or cognitive reactions cannot be adequately supported [12–17]. IEI-EMF has been associated with psychological components [18–23] but their exact role is not clear. Although a possible effect of exposure cannot yet be ruled out because of methodological obstacles in research primarily regarding exposure assessment and study design [14, 16], more recent approaches stress the importance of looking into the interaction of environmental, biological, psychological and social pathways . However, it is still controversial who should be categorised as having IEI-EMF. The lack of a validated, mutually accepted case definition and diagnostic instrument affects the quality of the research outcomes and increases the methodological heterogeneity, resulting in limited comparability between the studies. That stands in the way of a reliable estimation of the prevalence of IEI-EMF in the general population, proper meta-analysis of etiological evidence, the identification of health outcome patterns/profiles and contributes to a great deal of uncertainty regarding the characteristics, identification and management of this sensitivity by health care providers [25–27]. The descriptive terms used to define IEI-EMF. The inclusion criteria and procedure for the identification of individuals with IEI-EMF. 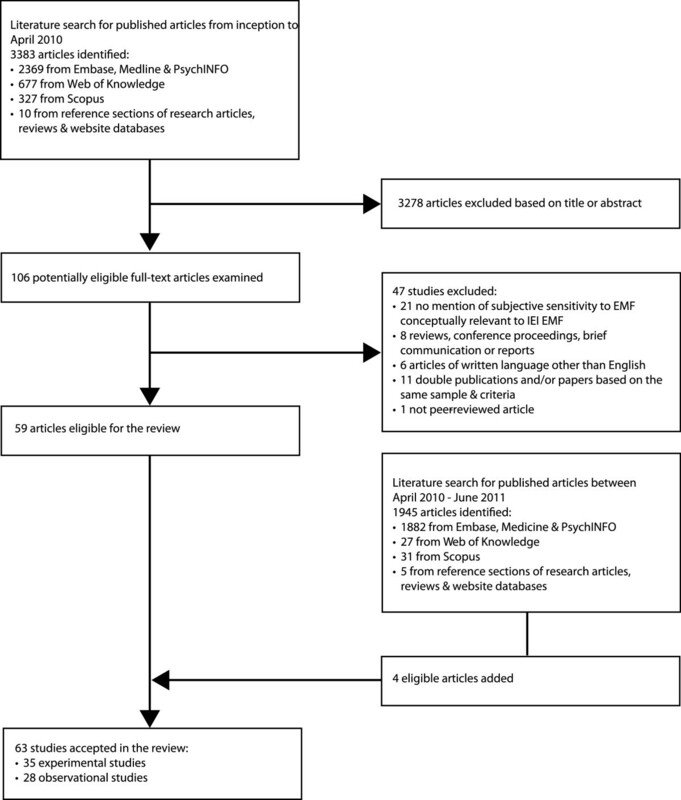 Initially, the following electronic databases were searched to detect relevant studies that were published from inception to April 2010: Embase (Elsevier B.V., Amsterdam, The Netherlands), Medline (US National Library of Medicine, Bethesda, Maryland), PsychInfo (American Psychological Association, Washington, DC). Web of Knowledge (Institute for Scientific Information, The Thomson Corporation, Stamford, Connecticut) and Scopus (Elsevier B.V., Amsterdam, The Netherlands). A wide range of (combined) keywords was used with regards to EMF exposure, sensitivity and related health outcomes, which is presented in Table 1. In addition to the electronic database searches, the reference sections of previous systematic reviews, key papers, international reports on EMF and health and research databases of websites focused on the issue of EMF such as the “EMF Portal” and the WHO webpage were checked for potentially relevant articles. A wide literature database held by the Mobile Phones Research Unit of King’s College London was also consulted. A second literature search was carried out in order to update our review with studies published from May 2010 to June 2011. Electrosensitivity, Electromagnetic hypersensitivity, Electrical sensitivity, Electromagnetic sensitivity, Electric hypersensitivity, IEI-EMF, Environmental intolerance, environmental illness. EMF, ELF, Electromagnetic field(s), Electromagnetic exposure, mobile telephones, mobile phone(s), Base stations, Powerlines, Celltowers, Antenna(e), UMTS, GSM, DECT, VDU, cell phones. Symptom(s), well-being, attributed symptoms, headache, fatigue. Only primary studies written in English and published in the peer-reviewed literature were considered as suitable for inclusion in the current review. Conference presentations, brief communications and reviews were excluded. The primary condition to include a study was the report of use of at least one criterion to identify individuals with IEI-EMF. Studies focusing on health effects from wider environmental exposures (such as chemicals) were eligible as long as they attempted to identify sensitivity to EMF in their investigation. Studies recruiting exclusively “healthy” individuals without any attempt to assess IEI-EMF or identify relevant individuals were excluded. Since the “attribution” of health complaints to EMF is not necessarily synonymous with IEI-EMF and it is not an established prerequisite for its existence, studies relying solely on “attribution” without any mention of and explicit conceptual link with IEI-EMF or synonymous terms were not considered eligible for this review. Among papers based on the same sample and identifying criteria of IEI-EMF, the first publication was included. For each included study, the following data were abstracted: reference and country, study design, methods and source of sample recruitment, IEI-EMF sample characteristics (such as sample size, age mean or range and gender distribution), type of sensitivity based on the triggering EMF source(s), the criteria used to identify individuals with IEI-EMF, exclusion criteria (based on self-report/interview or clinical examination) and the case definition procedure followed for the identification of IEI-EMF (such as self-report and/or medical examination to exclude the possibility that a diagnosed disorder was responsible for the reported health complaints) (Tables 2 and 3). The data provided in the tables were derived from the information that was given or could be inferred from the original publications. However, in some cases (part of) the necessary information was not provided in the reviewed articles. Rea et al., 1991 (USA) . Hamnerius et al., 1993(Sweden) . IEI-EMF subjects referred to a health care service/institution. Report of “distinctive” symptoms, occurrence of the symptoms within an hour from being exposed to VDU and disappearance or substantial reduction within a few hours after exposure termination. Somatic or psychiatric disorder that could account for the reported symptomatology. Subjective report, medical, psychiatric & psychological examination. Arnetz et al., 1995 (Sweden) . N = 20, m.a = 45, f.g = 75%. Report of symptoms attributed to EMF exposure. Subjective report, medical & psychiatric examination. Andersson et al., 1996 (Sweden) . N = 17, m.a = 41.7, f.g = 70.6%. Experience of “typical” symptoms of “electric hypersensitivity” when being in an “electrical environment”, duration of at least 6 months, limitations in daily functioning, experience of symptomatology within less than 30 minutes after exposure to electric equipment under experimental testing. Bertoft et al., 1996 (Sweden) . Voluntary participation of IEI-EMF subjects. N = 5, a.r = 46-60, f.g = 80%. Voluntary participation of a medical patient. N = 1 male, age = 35. Fear of a negative impact of health caused by EMF exposure, report of symptoms attributed to EMF such as fatigue, headache, lack of concentration, numbness & paresthesia in the arms, greasy feeling in the palms, inability to work due to the reported symptoms. Subjective report, medical & neurological examination. Sandström et al., 1997 (Sweden) . IEI-EMF subjects treated to a health care service/institution. N = 10, m.a = 47, f.g = 70%. Self-report of a combination of skin (mucous), eye & neurological symptoms, attribution of these symptoms to EMF emitted from VDT work, fluorescent light or TV. Somatic or psychiatric diseases severe enough to require medical treatment. Hillert et al., 1998 (Sweden) . N = 10, m.a = 40, f.g = 60%. Self-reported hypersensitivity to EMF, age between 18–65 y.o, being employed for at least 1 week during the past 3 months, symptoms had to show some variation due to perceived exposure to EMF or proximity to relative equipment. Medical or mental disorder that could account for the reported symptomatology, long period of sick leave, unemployment. Trimmel et al., 1998 (Austria) . N = 36, a.r = 18-36. Individual belief of an “exceptional reaction to EMF”, a score of >50 on a continuous rating scale between 0–100. Flodin et al., 2000 (Sweden) . IEI-EMF subjects who were members of a relative self-group or registered to a health care service/institution. N = 15, m.a = 48.3, f.g = 73.3. Attribution of symptoms to named EMF sources, mean reaction should occur within 60 minutes of exposure, there was no experience of symptoms at home or workplace when the subject was considered as “unexposed”, symptoms should disappear within a few days after exposure. Slow reaction or denial for participation because of symptom severity, undergoing treatment for medical conditions. Subjective report, medical examination (registered IEI-EMF subjects). Lohne-Rahm et al., 2000 (Sweden) . Voluntary participation after description of the study in newspaper advertisements or IEI-EMF subjects referred to a health care service/institution. Report of skin symptoms during a 30-minute exposure to EMF & symptom duration of at least 6 months. Diagnosed skin diseases, slow, excessive or no reactions during the experiment. Subjective report, medical examination (referred IEI-EMF subjects). Hillert et al., 2001 (Sweden) . N = 16, m.a = 39.5, f.g = 81.3%. Self-reported hypersensitivity to electricity, experience of change in symptoms within 24 hours after a perceived change in exposure to EMF, a history of VDU or fluorescent lights as the initial triggering factors. Somatic or psychological disorder that could account for the reported symptomatology. Subjective report, medical & psychological examination. Lyskov et al., 2001 (Sweden) . N = 20, m.a = 45.8, f.g = 75%. Hietanen et al., 2002 (Finland) . N = 20, m.a = 49, f.g = 65%. Self-reported hypersensitivity to EMF, experience of symptoms during a 30-minute (provocation) test period. Hillert et al., 2002 (Sweden) . N = 22, m.a = 42, f.g = 64%. Report of symptoms assumed to be caused by sensitivity to EMF. Medical or psychological condition that could account for the symptoms. Mueller et al., 2002 (Switzerland) . N = 63, m.a = 49.5, f.g = 51%. Self-reported sensitivity to EMF or “Electrical Hypersensitivity Syndrome (EHS)”. Leitgeb et al., 2003(Austria) . Randomly selected sample from general population (N = 708). Increased levels of “electrosensibility”, defined as the individual ability to perceive electric or electromagnetic exposures without necessarily developing health symptoms. Measurement of EMF perception thresholds. Österberg et al., 2004 (Sweden) . Randomly selected sample from general population (N = 13381), based on Östergren et al. (report) . N = 16, m.a = 41.8, f.g = 50%. Individual experience the past 2 weeks of “very much” physiologic “annoyance” attributed to FTL, and/or VDU and/or other electrical equipment. Belyaev et al., 2005 (Sweden) . Frick et al., 2005 (Germany) . Voluntary participation after description of the study in a local newspaper. N = 30, m.a = 41.7, f.g = 77%. Self-reported hypersensitivity to named EMF sources, attribution of severe symptoms that limited daily functioning & age between 18–64 y.o. or not experiencing limitations to daily living due to the reported symptomatology. Wenzel et al., 2005 (Germany) . N = 3 male subjects, m.a = 37. Concern about the effects of EMF exposure, report of various symptoms attributed to VDU and/or powerlines, abstinence from smoking. Regel et al., 2006 (Switzerland) . Voluntary participation after description of the study in advertisements in a local newspaper, flyers & use of databases of two previous studies with IEI-EMF subjects willing to participate in future research projects. N = 33, m.a = 37.7, f.g = 57.5%. Self-reported sensitivity to EMF emitted by mobile or cordless phones & antennas. Regular consumption of narcotics or psychoactive drugs in the last 6 months, smoking, diagnosed with a chronic disease, pregnancy, medical history of head injuries, neurologic/psychiatric diseases, sleep disturbances, average alcohol consumption of >10 drinks per week, average consumption of caffeinated beverages amounting to >450 milligrams caffeine per day, shift workers, undertaking long-haul flights of >3 hours time zone difference within the last month. Rubin et al., 2006 (UK) . Through mailshots organised by an IEI-EMF support group, advertisements & articles in health care institutions & practices. N = 71, m.a = 37.1, f.g = 56%. Frequent experience of headache-related symptoms within 20 minutes of using a 900 MHz GSM MP. Age of <18 or >75 y.o, pregnancy, psychotic illness, use of antidepressants, report of severe symptoms at baseline while in the testing room. Eltiti et al., 2007 (UK) . Voluntary participation through local advertising, IEI-EMF action groups & word of mouth. N = 56, m.a = 46.1, f.g = 42.9%. Individual experience of negative health effects attributed to EMF emitted from mobile phone devices and/or base stations, based on the “Electromagnetic Hypersensitivity Questionnaire” . History of brain injury, currently suffering from epilepsy or claustrophobia, undergone treatment for mental disease or psycho-active medication within 4 months before the study. Schröttner et al., 2007 (Austria) . Three different recruitment sources: 1. EMF self-help groups. 2. Through advertisements in local newspapers & inviting patients that contacted a health care service/institution for their EMF-attributed symptoms. 3. Subjects reporting severe sleep problems being deeply convinced that these were caused by EMF exposure. Recruitment 1: N = 37, a.r = 27-81, f.g = 67.6%. Recruitment 2: N = 29, a.r = 32-63, f.g = 79%. Recruitment 3: N = 24, a.r = 37-73, f.g = 62.5%. Self-reported hypersensitivity to electricity, attribution of symptoms to EMF, active avoidance behavior to EMF sources. Sensitivity only to sources of flickering light such as VDU fluorescent tubes. Medical examination (for part of the group of “Recruitment 2”). Bamiou et al., 2008 (UK) . Voluntary participation after description of the study through advertisements at a health care services/institutions & relative website & short film shown on the national television. N = 9, m.a = 36.7, f.g = 66.7. Report of headache and/or disorientation, dizziness, muzziness, nausea attributed to mobile telephone use, age between 20–55 y.o, normal tympanometry & normal pure tone audiometric thresholds in both ears. Hillert et al., 2008 (Sweden) . Voluntary participation after description of the study in newspapers, or individual initiative. N = 38, m.a = 28, f.g = 63.2%. Report of headache, vertigo or other kind of pain or discomfort in the head attributed to MP use. Attribution of symptoms to sources other than MP, medical or psychological illness, undergoing medication, sleep disorders, hypertension, pregnancy, history of severe injury. Kwon et al., 2008 (Finland) . Voluntary participation after description of the study in an advertisement that announced a monetary prize. N = 2 male subjects, m.a = 37. Report of suffering from severe symptomatology after use of a mobile phone, high score on a scale on EMF sensibility (defined as the individual ability to perceive EMF without necessarily developing symptoms). Neurological disease, auditory abnormality, being on permanent medication. Landgrebe et al., 2008a (Austria & Germany) . Voluntary participation after description of the study in newspapers and informative events at public locations and institutions. N = 88, m.a = 50.5, f.g = 58.4%. Leitgeb et al., 2008 (Austria & Germany) . Voluntary participation after description of the study in media. N = 43, m.a = 55.5, f.g = 60.5%. Personal conviction on a causal role of EMF indicated by the employment of precautionary activities and/or measures (e.g. reducing fields, measuring exposure in the household etc. ), above-normal symptom scores on standardized questionnaires such as the “Freiburger Personality Inventory”  and “PSQI”  (at least 5 points on the latter). Neurological & psychiatric disorders, somatic conditions that could account for sleep disturbances, drug consumption less than 2 weeks before the study, medical treatment for severe conditions. Augner et al., 2009 (Austria) . N = 8, a.r = 18-67. Self-reported electromagnetic hypersensitivity (rated as “strong” or “very strong”). Furubayashi et al., 2009 (Japan) . Randomly selected female subjects (N = 2472). N = 11, m.a = 37.3. History of myocardial infarction epilepsy or other (psycho) pathological condition, undergoing medical treatment for severe medical conditions. Nam et al., 2009 (South Korea) . Voluntary participation after description of the study through advertisements at a health care service/institution. N = 18, m.a = 26.1, f.g = 55.5%. Self-reported hypersensitivity to EMF emitted only by CDMA cellular phones. Szemerszky et al., 2010 (Hungary) . Voluntary participation of university students. Self-reported electrosensitivity (rated from “not at all” to “fully”). Nieto-Hernandez et al., 2011 (UK) . Voluntary participation after description of the study within UK Police Forces with the use of circular emails, notices in police newsletters and intranet sites & advertisements in police-related magazines & websites. N = 60, m.a = 35.6, f.g = 11.7%. Report of symptoms attributed to TETRA, report of being at least 70 % sure that the radio signal was the responsible source, occurrence of symptoms/sensations within an hour of radio use and when the radio was used near the head. *Although the studies of Österberg et al. and Carlsson et al. are based on the same sample , they have some differences in terms of inclusion criteria and/or identification methods. Abbreviations: N.R., Not reported; N.R/E, Not reported or employed; EMF, Electromagnetic fields; IEI-EMF, Idiopathic environmental intolerance attributed to EMF; m.a, Mean age; a.r, Age range; f.g, Female gender distribution; y.o; Years old; MP, Mobile phone(s); VDT, Video display terminal: VDU, Video display units; GSM, Global system for mobile communications; CDMA, Code division multiple access; TETRA, Terrestrial trunked radio; PSQI, Pittsburgh sleep quality index. Bergdahl et al., 1998 (Sweden) . N = 28, m.a = 45.5, f.g = 50%. Report of symptoms assumed to be caused by VDU and/or other EMF sources. Voluntary participation after description of the study in a medical journal. Hillert et al., 1999 (Sweden) . Subjects selected from an older occupational health survey & IEI-EMF subjects referred to a health care service/institution. N = 62, a.r = 20 ≤ . Stockenius et al., 2000 (Switzerland) . Voluntary participation of male subjects (mostly university students) after description of the study through advertisements. Self-reported electrosensitivity to named sources (ranked from “very insensitive” to “very sensitive”). Bergdahl et al., 2001 (Sweden) . N = 44, m.a = 47, f.g = 57%. Report of symptoms assumed to be caused by “abnormal sensitivity to EMF”. Subjective report, medical interview & examination. N = 14, m.a = 46, f.g = 64.3%. Self-reported hypersensitivity to EMF including disabling fatigue attributed to EMF exposure. Medical condition that could account for the reported symptomatology. N = 20, m.a = 47, f.g = 55%. Report of a combined pattern of skin, general and ocular symptoms & attribution to EMF exposure. Chronic diseases, acute illness the last 6 months, undergoing hormonal, hypotensive or sedative therapy. Randomly selected sample from general population (N = 10605). Self-reported hypersensitivity to named EMF sources. Levallois et al., 2002 (USA) . Randomly selected sample from general population (N = 2072). N = 68, m.a = 43.4, f.g = 58.8%. Report of being allergic or very sensitive when being near electrical devices, computers and/or powerlines. Stenberg et al., 2002 (Sweden) . General sensitivity: N = 50, m.a = 49, f.g = 62%. VDT specific: N = 200, m.a = 50, f.g = 78.5%. General: Experience of symptoms attributed to EMF sources in general within 24 hours after being exposed. VDT-specific: Experience of (mainly skin) symptoms attributed to VDT, TV screens & fluorescent light within 24 hours after being exposed. For all subjects, the possible association between exposure & symptoms could not be ruled out. Lack of medical records or examination, diagnosed medical condition, no symptom attribution to EMF within 24 hours after being exposed. Subjective report, medical records & examination. Sandström et al., 2003 (Sweden) . IEI-EMF subjects registered to a health care service/institution. N = 14, m.a = 48.9, f.g = 64.3%. Individual perception that exposure to VDT, FTL, TV and/or other EMF sources causes symptoms within 24 h, the possible exposure-outcome association could not be ruled out. Symptoms indicating autonomic nervous dysregulation, undergoing hormonal or hypotensive therapy, having arrhythmia due to frequent non-sinus beats or severe cardiac conduction disturbances. Bergdahl et al., 2004 (Sweden) . IEI-EMF subjects referred and registered to a health care service/institution. N = 250, m.a = 49.1, f.g = 75.2%. Individual perception that exposure to VDT, TV and/or other EMF sources causes symptoms within 24 h.
Röösli et al., 2004 (Switzerland) . The survey was described to various local institutions and organizations which informed & encouraged IEI-EMF subjects to participate. N = 394, m.a = 51, f.g = 57%. Report of symptoms (open question) attributed to EMF exposure. Bergdahl et al., 2005 (Sweden) . N = 33, m.a = 47, f.g = 51.5%. * Carlsson et al., 2005 (Sweden) . N = 2748 (“some annoyance” by EMF), N = 354 (“much annoyance” by EMF), a.r = 18 ≤ . Individual experience the past 2 weeks of “some” or “much” physiologic “annoyance” attributed to FTL, and/or VDU and/or other electrical equipment. Eriksson et al., 2006 (Sweden) . Random sample from general population (N = 2154). N = 46, a.r = 18-64, f.g =76%. For the past 3 months, report of 5 symptoms on a weekly basis and 5 on a monthly basis: These symptoms could be: fatigue, feeling heavy-headed, headache, concentration difficulties, itching, burning or irritation of the eyes, dry eyes, dry facial skin, flushed facial skin, itching/stinging/tight or burning sensation in facial skin & cold hands or feet. Schreier et al., 2006 (Switzerland) . Randomly selected sample from general population (N = 2048). N = 107, a.r = 14<, f.g = 54.5%. Report of adverse health effects (open question) attributed to EMF at the time of the interview or anytime in the past. Schüz et al., 2006 (Germany) . Voluntary participation from EMF self-help & action groups, internet & media advertisements, invitation letters. N = 107, f.g = 54%. Investigation 1&3: IEI-EMF subjects through local self-help & action groups or personal contact. Investigation 2: Random selection from the general population (N = 3633) . Investigation 1: N = 50, m.a = 52.5, f.g = 66%. Investigation 2: N = 698. Investigation 3: N = 88, m.a = 48.7, f.g = 53.4%. Investigation 1: Self-reported sensitivity to EMF, attribution of symptoms to EMF. Investigation 2 &3: Self-reported sensitivity to EMF. Landgrebe et al., 2007 (Germany) . N = 23, m.a = 41.3, f.g = 74%. Report of severe symptoms that limited daily functioning, attribution of these symptoms to named EMF sources & age between 18–64 y.o. Hardell et al., 2008 (Sweden) . N = 13 female subjects, m.a = 53. Report of symptoms attributed to EMF. Lidmark et al., 2008 (Sweden) . Voluntary participation of members of an IEI-EMF self-help group. Schröttner et al., 2008 (Austria) . Randomly selected sample from general population (N = 526). N = 16, a.r = 15-80, f.g = 50%. Report of disturbance/adverse health effects (open question) attributed to named EMF sources, looking for medical help because of symptom severity. Dahmen et al., 2009 (Germany) . Sample selected from EMF self-help groups, an internet-based survey on EMF and health & local advertisements. N = 132, m.a = 51.5, f.g = 68.2%. Acute psychiatric disorder (after psychiatric examination). Johansson et al., 2010 (Sweden) . Voluntary participation after description of the study in newspaper advertisements. MP-specific sensitivity group: N = 45, m.a = 45.7, f.g = 62%. General sensitivity group: N = 71, m.a = 51.6 f.g = 82%. Report of symptoms attributed to: 1. MP use only, 2. VDT use only or 3several types of electrical equipment. Mohler et al., 2010 (Switzerland) . Randomly selected sample from general population (N = 1212). Self-reported electrohypersensitivity or report of adverse health effects attributed to EMF. Consumption of sleeping pills, night shift workers, severe disability. Nordin et al., 2010 (Sweden) . Voluntary participation of IEI subjects after description of the study in a local and a national newspaper. N = 2, a.r = 18-69. Report of being intolerant to EMF. Röösli et al., 2010 (Switzerland) . Randomly selected sample from general population (N = 1122). N = 130, a.r = 30-60, f.g = 72.3%. *Although the studies of Carlsson et al. and Österberg et al. are based on the same sample , they have some differences in terms of inclusion criteria and/or identification methods. This was the case also for the studies of Mohler et al. and Röösli et al. .
Abbreviations: N.R., Not reported; N.R/E, Not reported or employed. FTL, Fluorescent tube light; EMF, Electromagnetic fields; IEI-EMF, Idiopathic environmental intolerance attributed to EMF; m.a, Mean age; a.r, Age range; f.g, Female gender distribution; y.o; Years old; MP, Mobile phone(s); VDT, Video display terminal: VDU, Video display units. The literature search was performed by the first author and the evaluation of inclusion criteria by CB, IVK and GJR, with uncertainties resolved through consultation among all the authors. The initial screening was based on the titles and/or abstracts. Next, the hard copies of the potentially eligible publications were examined to assess whether they met the inclusion criteria. Figure 1 illustrates the literature search process. We examined 5328 citations in total and identified 35 experimental and 28 observational studies that met our inclusion criteria. Flow diagram outlining the study selection process. When reported, sample sizes of subjects with IEI-EMF ranged between 1 to 100 in the experimental studies and from 2 to 2748 in the observational studies. The percentage of female participants (exempting case-studies) ranged between 0 to 81.3% and 50% to 100% respectively. In all studies, the reported mean age of IEI-EMF individuals varied between 26.1 and 55.5 years. IEI-EMF triggered by several different EMF sources (“general”) was the sensitivity type of primary focus in the included investigations (n = 48), while 14 studies concentrated exclusively on “source-specific” IEI-EMF and three on both “general” and “source-specific” IEI-EMF. There was a variety of synonyms of IEI-EMF in the literature such as "hypersensitivity (HS) to EMF", "electromagnetic Hypersensitivity (EHS)", "electrohypersensitivity", "environmental annoyance attributed to EMF", "electromagnetic distress syndrome" and "environmental illness". “Hypersensitivity to EMF” (and its variants) was by far the most frequently used definition/descriptive term (Figure 2). In 35 studies the case definition procedure was solely based on the subjective report of the respondents. In 28 studies it was mentioned that objective assessment (e.g. medical and/or psychological assessment) was additionally taken into account. 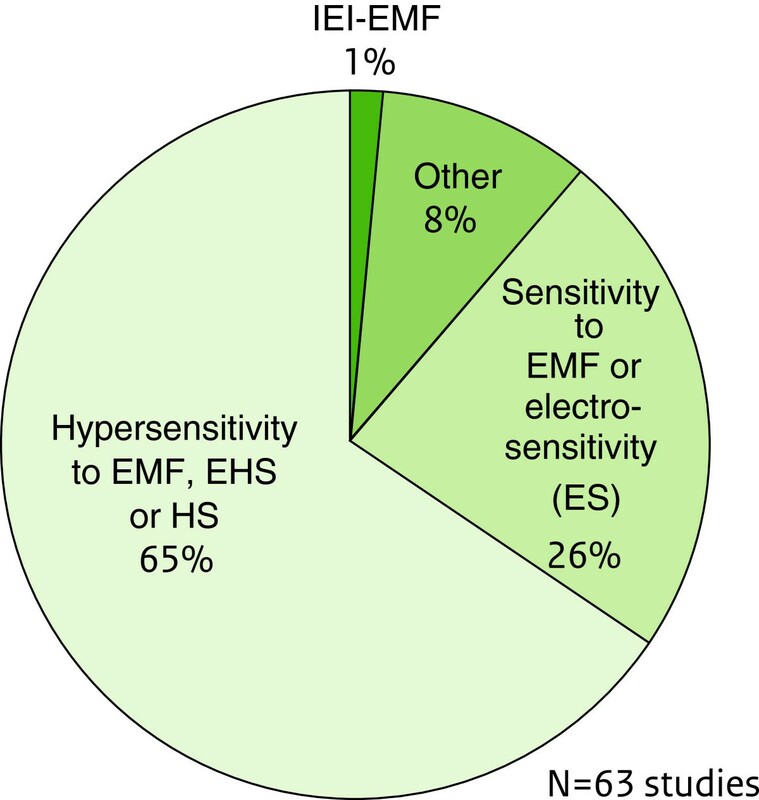 Distribution (%) of terms used to describe IEI-EMF in the reviewed literature. Abbreviations: IEI-EMF, Idiopathic environmental intolerance attributed to EMF; EHS, Electrohypersensitivity; HS, Hypersensitivity. The principal method of sample recruitment was via study description in advertisements and/or local or national media (22 studies). The vast majority of the reviewed studies were conducted in Europe (58 studies). Attribution of NSPS to either various or specific sources of EMF (being reported 13 times). Self-reported IEI-EMF (or synonymous terms) (n = 14). Experience of symptoms during or soon (from 20 minutes to 24 hours) after the individual perception or actual presence or use of an EMF exposure source (n = 10). High score on a symptom scale (n = 6). In addition, two studies used limitation in daily functioning of the individual due to the attributed health effects as an inclusion criterion. The main exclusion criterion was the existence of a medical and/or psychiatric or psychological condition that could account for the reported health complaints (n = 20). Other exclusion criteria included undergoing treatment for somatic or psychiatric conditions (n = 8), pregnancy (n = 5), history of severe injuries (n = 3) and regular smoking (n = 2). In 16 studies the case definition procedure did not only rely on subjective report, but also on medical and/or psychiatric and/or psychological examination. In eight studies, the sample recruitment was based on participants who were already referred or registered to a health care institution (such as a university hospital) for their health complaints. All extracted data from the experimental studies are presented in Figure 2. Self-reported IEI-EMF (or synonymous terms) (n = 16). Attribution of NSPS to either various or specific EMF sources (n = 12). Experience of symptoms during or soon (from 20 minutes to 24 hours) after the individual perception or actual presence or use of an EMF exposure source (n = 3). Limitation in daily functioning of the individual due to the attributed health effects (n = 2). The main exclusion criteria were a medical and/or psychiatric or psychological condition that could account for the reported health complaints and undergoing treatment for somatic or psychiatric condition (n = 4). Eleven studies included medical and/or psychiatric and/or psychological examination to assess whether a pathological condition was responsible for patients’ complaints. In nine studies the sample was based on participants who were already referred or registered to health care institutions for their complaints. All extracted data from the observational studies are listed in Table 3. The prevalence of IEI-EMF in randomly selected samples of population-based epidemiological studies varied and seemed to be influenced by the number and degree of strictness of the applied identification criteria. This is illustrated in Figure 3. These differences could also be due to the population under study, year of study and sample stratification (e.g. age range). Prevalence (%) of IEI-EMF based on the identifying criteria employed by population-based observational studies. The present systematic review based on an extensive literature search, summarized the case definition criteria and methods that have been used in the published literature to date for the identification of subjects with IEI-EMF. It is noteworthy that only 1% of the reviewed studies used the term “IEI-EMF” as a descriptive term, despite the fact that it has been proposed by WHO since 2005 . Sixty-five percent of the studies used the description “Hypersensitivity to EMF” which seems to be mainly characterized by the following aspects: Self-reported sensitivity to one or more sources of EMF, attribution of NSPS to either several or specific EMF sources (such as mobile phones and VDUs), experience of symptoms during or soon after (from 20 minutes to 24 hours) the individual perception or actual presence or use of an EMF source and absence of a (psycho)pathological condition accounting for the reported health complaints. In the majority of the studies the case definition procedure was based exclusively on self-report. In a smaller number of investigations, medical and/or psychiatric and/or psychological assessment was included. In most of these studies participants were recruited from registries to a health care institution for their symptoms and for whom medical data were available. Although there were no important differences between observational and experimental studies in the most frequently employed criteria, experimental studies used a larger number of criteria per investigation compared to observational studies. Moreover, the demographic profile of the recruited individuals with IEI-EMF in terms of age and gender was quite consistent; the frequency of female gender and age over 40 years were considerably higher in most of the studies. Despite previous attempts to bring order to this field [6, 53, 70], as it appears in the literature, IEI-EMF is still predominantly a self-reported sensitivity without a widely accepted and validated case definition tool. This could be due to the absence of a bioelectromagnetic mechanism  or because of the varying patterns regarding the symptom type, frequency and severity [6, 41]. The other way around could also be the case: The lack of validated case definition criteria could have hindered the identification of homogeneous patient groups and consequently the recognition of symptom profiles and a physiologic mechanism. Furthermore, the application of very broad criteria could dilute the power of the studies and make difficult the detection of those individuals that really suffer from IEI-EMF. For example, although “Attribution” of NSPS to EMF could be considered as a first indication of suffering from IEI-EMF, it is questionable whether it comprises a sufficient identifying criterion when used alone. Several subdivisions may exist within IEI-EMF that may be of relevance to clinicians and researchers. One such division is that between patients for whom an alternative diagnosis exists, which might account for their symptoms and those for whom it does not. The absence of screening for pathological conditions which might underlie the symptoms reported by participants in many studies was notable. Previous studies have identified occasionally high levels of other diagnoses in such patients, such as somatoform and anxiety disorders which might account for their ill-health [89, 90]. Including these individuals in the same sample as those for whom there is no clear explanation for their symptoms may reduce our ability to identify causal factors for IEI-EMF. An additional distinction that we may need to take into account is between patients who attribute symptoms to short-term exposure to EMF and those for whom longer-term exposure is relevant. Furthermore, it remains unclear whether generalized and source-specific IEI-EMF should be assessed separately or not. Exposure from far-field sources such as high-voltage overhead powerlines and mobile phone base stations is mostly continuous and people often perceive it as less controllable compared to near-field sources such as mobile phones  but there is still no convincing evidence for source-specific sensitivities . As differences may exist between IEI-EMF patients in terms of their psychological and health-related characteristics, division into subgroups for the purposes of research may be of use [22, 23]. Perhaps the most complicated issue is to figure out whether self-reported-NSPS and objectively assessed physiologic reactions are preceded by events of the relevant (EMF) exposures, distinguishable from other random exposure events experienced during the day. Use of a prediction model based on modelled exposure from various sources [91, 92] could be a solution; however it is questionable whether and how it could be systematically incorporated in a case definition tool. Table 4 illustrates a number of proposed aspects for IEI-EMF, based on a synthesis of the existing identifying criteria in the reviewed literature. Considering the fact that the reported symptoms are quite common in the general population and also the lack of symptom patterns [6, 53] and etiology, the only parameter that clearly distinguishes sensitive from control individuals is the causal attribution of symptomatology to EMF exposure. Therefore, the attribution of health outcomes and self-reported sensitivity to EMF inevitably constitute, at the moment, the cornerstone of IEI-EMF case definition in research and clinical practice. Additional aspects such as medical examination/history would elucidate whether the reported health outcomes can be explained by underlying pathology. Cognitive and behavioral aspects could be complementarily included in the case definition, since evidence on their role in IEI-EMF is promising  but not yet established. Moreover, taking into account potentially harmful environmental agents other than EMF would be an important addition for research. - Subjective report of symptoms/physiologic reactions. - The possibility that a known medical or psychiatric condition is the cause of the reported health complaints should be excluded with the use of standardized interview and patient history. - The possibility that a known medical or psychiatric condition is the cause of the reported health complaints should be excluded after thorough physical and psychiatric examination and detailed patient history. - Current status of residential and occupational exposure to harmful environmental agents that could be related to the reported complaints (other than non-ionizing EMF). - Subjective report of being sensitive to specific or various EMF sources. - Symptoms occur during or after the individual perception or actual exposure, presence or use of an EMF source. - Regular avoidance behavior towards EMF source(s) due to the fear of a negative impact of EMF on health. This is the first time that a systematic review is conducted on definitions and identifying criteria for IEI-EMF. Given the large number of included articles, it is unlikely that any missing (or even excluded) studies would alter the results or increase any publication bias, especially since the aim of the current paper was not to assess etiologic associations. It is a challenge how all the different case definition parameters for IEI-EMF can be concisely embodied in one international operational tool which could be used in research and clinical practice, and how this instrument could be adjusted to the possible cultural differences (e.g. in terms of wording/phrasing questions on health outcomes). Nevertheless, without the harmonization of the conceptual framework and validation of identifying criteria, the value of the case definition standards for IEI-EMF will remain insufficient and possibly unreliable. Apart from research, this has an important impact also in primary care; physicians, who are often the first to be contacted by the sufferers, are usually not adequately informed about IEI-EMF, which can affect the patient-doctor interaction and the management of the patient . In order to properly construct an operational tool, a proposed two-phase approach can be briefly described as follows: In the first phase, a case definition and case selection tool should be developed, taking into account sources such as the published literature, expert opinions (e.g. based on a Delphi procedure ) and information on IEI-EMF patient characteristics from available datasets/ongoing research. At this stage, EMF measurements or provocation tests should not be a priority since a provocation study will only have added value after the formulation of a proper case definition and participant selection. Additionally, if the aim of a “case selection tool” is to routinely test cases where symptoms occur without a clear underlying pathology, then that tool should be concise, inexpensive and easy to implement, such as a short questionnaire or checklist. In the second phase, the case definition tool should be validated in terms of practical usability and the ability to differentiate between subgroups of IEI-EMF and patients with other conditions (e.g. chronic fatigue) who report similar symptoms. Based on the findings, the requirements for a follow up study could be outlined. IEI-EMF is a poorly defined sensitivity. Heterogeneity and ambiguity of the existing definitions and criteria for IEI-EMF show the necessity to develop uniform criteria that will be applicable both in research and clinical practice. Broader criteria identified in the published literature such as attribution of NSPS to EMF and subjective report of being EMF sensitive could be used as a working definition for IEI-EMF which will serve as a basis for the development of a case selection tool. However, further optimization is required, testing its reliability and validity in several different patient groups, leading to an international multidisciplinary protocol with the active involvement of health care providers. This could also be a stepping stone for the harmonization of concepts and case definition for the broader condition of IEI. The current study is part of the project INCORPORATE “International collaboration on symptoms, psychological aspects and EMF exposure estimates: Towards harmonization and validation”, funded by The Netherlands Organization for Health Research and Development (ZonMw). The study sponsor had no involvement in study design, writing and interpretation of the results and in the decision to submit the study for publication. The authors would like to thank Dr Rosa Nieto-Hernandez for her help in structuring the literature search protocol and Dr Rik Bogers for his feedback on the paper. In addition, the authors would like to thank Dr Joris Yzermans and Dr Mariette Hooiveld for their ideas regarding the suggestions for the development of a screening tool for IEI-EMF. GJR has previously been funded by the UK Mobile Telecommunications and Health Research programme (http://www.MTHR.org.uk) and has acted as an expert witness for the Diocese of Norwich relating to the installation of Wifi on Church property. EL chairs the Science Forum of the Dutch Expertise Platform for Electromagnetic Fields (http://www.kennisplatform.nl/). All the authors participate in the international multidisciplinary project INCORPORATE of the National Institute for Public Health and the Environment (RIVM). CB carried out the literature search, drafted the manuscript and incorporated input from all the rest authors in the manuscript. IVK and GJR conceived and coordinated the study and provided critical comments on the manuscript. EL provided critical comments on the manuscript. All authors have read and approved the final version of the manuscript.